It is a fundamental business and professional necessity that law firms have a signed engagement letter for a new client, stating each party's responsibilities for making the engagement a success. As we have often said, your firm will have an easier time meeting client expectations and collecting fees if you incorporate these into the engagement letter. The process aims to set forth the goals and expectations of the client and how they define the success of the engagement. However, even a detailed engagement letter is not a guarantee against future problems. In large firms, when such a troubled relationship develops, the overall cost of a bad client relationship to each partner is minimal. Small firms see an immediate reduction of income, and for that reason often are tempted to accept or continue a worrisome relationship, with the misguided hope that things will improve and that a fee will materialize. Such hope is rarely justified. If, at the time of sending a non-engagement letter, there has been no actual legal work performed, it would be best not to charge for the time expended to that point. But if billable time is recorded before the firm concludes that going further is not wise, the dis-engagement letter should clearly inform the client that work is being stopped with adequate notice (for example, 60 days) and state, consistent with ABA's Rule of Professional Conduct 1.16 ("Declining or Terminating Representation"), that the client must pay for work done to date. "Firing" a client should not be done lightly, but if the client does not comply with the engagement agreement, both parties will be better served by a separation. We're finally "on the road" again. Last week, we started north to Mammoth Lakes, CA. Then, last Sunday, we left Mammoth and drove to Carson City, NV, home of the Kit Carson trail and capital city of Nevada. Then we headed for Susanville for a couple of nights. Travel in the Airstream is a hoot; we have our home on wheels and can do just about anything we can do at home. Of course, when you have technology challenges (as we did on Saturday), it's not so easy. Redundancy is often a good thing. Because we have two computers with us, the fact that one "bombed" is inconvenient, but not catastrophic. Look at your law office and ask yourself the same question: If something goes down, will I be o.k. with what is left? 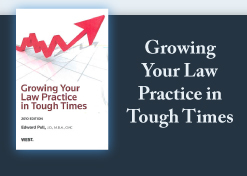 That's a key message in our book Disaster Preparedness & Recovery Planning for Law Firms.